The heart is often spoken of as the seat of ‘love’ and ‘compassion’, which of course it is, but it’s also a place of truth and courage, and if we dare to venture there it can reveal hidden truths about ourselves. Physically, we know that the heart is an essential muscle that pumps blood, oxygen and nutrients around the body. Without one we wouldn’t be alive, and if problems occur within it, it’s time to pay attention. In an esoteric sense, the heart and chest are where Anahata Chakra lies. Now, it doesn’t matter if you ‘believe’ in chakras at all – not even the ancient Yogis were trying to convince anyone that there are actually coloured spinning wheels of energy located along the spine. It’s metaphorical, and what each chakra represents can be used as a map, guiding us towards understanding more about ourselves, our lives, our actions and the reasons behind them. Anahata means ‘unstruck’, it represents a place within us that is unstruck or untouched by the outside world, the ego, or our conditioning. Because of it’s unstruck nature, it is often thought of as the place where truth is found. We’ve all heard the expressions “follow your heart” or “listen to your heart”, and this is exactly why; because it will tell you the truth. If we ask our minds what we want, we’re likely to hear an answer that has been conditioned by our previous experiences and our ego. For example, in your next Yoga class – if the teacher offers a posture that looks a little too challenging or unaccessible – one that you know would actually probably be physically damaging for you right now, or if you’re offered the chance to take a posture a step further than usual, there’s a likelihood that the mind will want to do that posture….. If you paused for a moment though and asked your heart it might well say something very different. The ego (often referred to as ‘the mind’) doesn’t necessarily care if we physically hurt ourselves, it just wants to be ‘the best’ – which is why many injuries occur when we’re in an ego-driven state as opposed to a heart-centred one. Ask your heart what it wants and needs, and it will generally keep you pretty safe in class…. As the fourth Chakra, Anahata is the place which divides the chakra system into manifest (muladhara, svadisthana and manipura are closely related to our more primal instincts, physical body, ego and sense of ‘self’) and unmanifest (vishuddi, ajna and sahasrara are connected to our sense of innate ‘higher wisdom’, related more to the practices of meditation, inward-focus, and higher consciousness). Anahata is therefore the bridge which connects body and mind, and by residing here we remain in-touch with our bodies while focussing more on higher aspects of ourselves. The Anahata Chakra is linked to our sense of touch and ability to heal ourselves and others. Look at it scientifically and it makes total sense; when we’re in a more positive, generous and loving state of mind, our body is also more relaxed; cells and tissue can repair themselves more easily, and our DNA expresses itself differently than if we’re in a cold, shut-off, and angry state. So, by moving with more awareness in the heart – the place of courage, truth and unconditional love, we can more easily move through the layers and armour of gross matter, conditioning and ego, until we’re finally able to find the truth underneath. The truth is a scary place to venture into, but the more we visit it , the less scary it gets…. Much like practiting the yoga posture Ustrasana! Ustrasana or ‘camel pose’ is exactly one of those postures which has to be approached with humility and truth. Big backbends generally feel amazing, provide a hit of energy and stimulate the nervous system. They’re also quite intimidating though; as we spend most of our time moving forwards, hunching over and subconsciously protecting the vulnerable front-side of the body. We’re less spacially aware when it comes to what’s going on at the back of the body, and we usually have less of an ability to physically sense parts of us on the back. (Feldenkrais has some fascinating exercises in the book ‘Awareness Through Movement’ which help to increase our ability to sense parts of the body which we usually aren’t aware of, such as the back and the place at the back of the head between the ears). Because of this, moving backwards in space can be scary, and it asks us to move truthfully into the unknown. Ustrasana can be taken in stages (because really – what’s the rush in ‘getting there?’ That’s how injuries happen….) It’s essential to ensure the spine is properly prepared, and that there’s plenty of fluidity in the synovial joints and de-compression of the vertebrae. 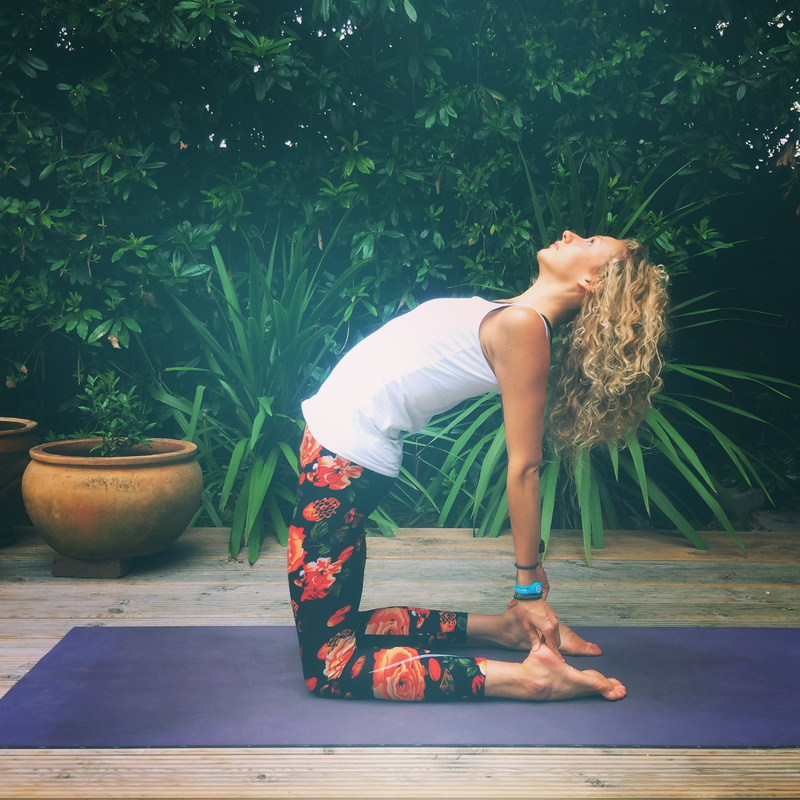 Backbends are not just about ‘bending backwards’; they’re more about extending the spine and opening the front of the body. Focus on movements that create space in the spine, and postures like Adho Muka Svanasana, and even Urdhva Muka Vrsasana (upward-facing tree pose, more commonly referred to as handstand….) can be effective for de-compressing the spine. Practice plenty of preliminary backbends like Bhujangasana (cobra), Salabhasana, Urdhva Mukha Svanasana (upward facing dog) and Dhanurasana before entering Ustrasana, as well as opening the quadricepts and hip flexors with Anjaneyasana and Ashta Chandrasana (low and high lunges). Maintain core strength in a lengthened position by practicing variations of plank, and ‘sphinx pulses’ or ‘roll-ups’. From a kneeling position, bring the hands to the hips or lower back, encouraging the tailbone to stay long (imagine the bottom of the spine lengthening downward towards the back of the knees). Imagine the spine lengthening out of the bowl of the pelvis as you inhale, and as you exhale draw the shoulders back and open the chest. 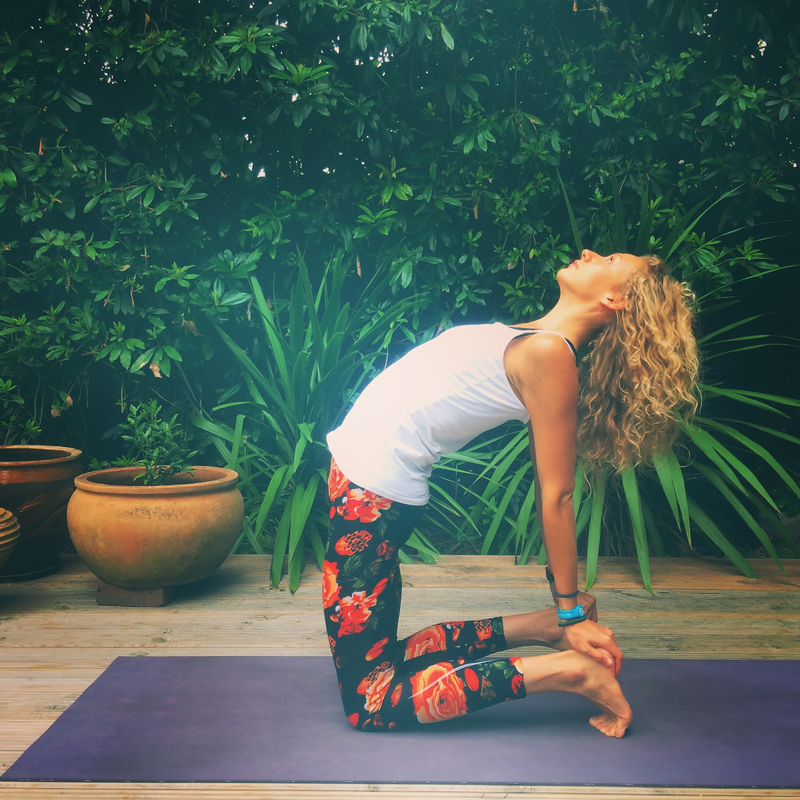 As you open up, remember to root downwards with the thighs, knees, shins and feet, as the ability to open and lengthen properly is built upon creating the foundations of grounding and stabilising first. Continue with this action of lengthening and opening, and this may be as far as you go today. It’s important not to grit the jaw or tense the neck or throat – as this will signal to the body that there’s a problem! Instead, find the soft pallet by running your tongue along the roof of the mouth until you reach the soft part at the back. This place has a very physical connection to the spine, core and pelvic floor, and if you focus on lengthening and reaching upwards through there, it can help to maintain extension in the spine. Many people complain of feeling back-ache after practicing Ustrasana, and this is often partly due to the fact that we don’t use this part of the back very much, we hold it rigid and stiff…. Which is why it becomes rigid and stiff…. Another reason is that we focus too much on the act of bending into a deep backbend, putting pressure on the vertebral disks of the lumbar spine and causing compression of the vertebral disks. When you back-bend, imagine creating a long arc-like shape along the spine, rather than a harsh V or U shape. This goes for all backbends, and is also especially useful to remember in urdhva Dhanurasana or ‘upward facing bow’. To go further, keep pressing or grounding downwards through the thighs and legs as you lengthen and open the upper body, and eventually bring the hands down to hold the heels one at a time. This is the part we need to focus on – maintaining that lengthening and opening action – don’t stop and collapse just because you’re ‘there’! Continue to lengthen upwards through the spine, soft pallet and crown of the head, as the strength of the thighs and core maintains your ability to feel stable and grounded. Breathe into the sternum and center of the chest, gently pressing the mid point of Anahata upwards. Postures like this also act as a way to stimulate the thymus gland, which helps ito release endorphins and hormones which promote a sense of well-being and relaxation. (Tapping techniques or ‘EFT’ (emotional freedom techniques) include tapping the Thymus as a way to overcome anxiety and stress, and is often accompanied by an affirmation or mantra to help integrate a more positive way of thinking. To go further still, maintain the actions you’ve been practicing, but un-tuck the toes so the tops of the feet press into the floor. Stay here for 5-10 breaths, with the awareness in the center of the chest and on your sense of touch, noticing what you physically feel while you’re here. 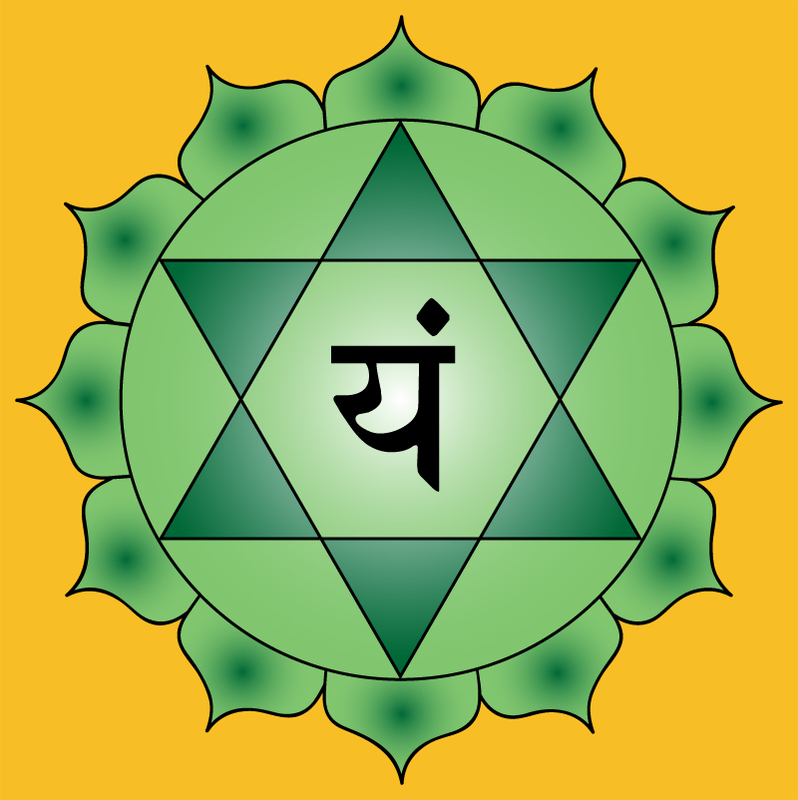 Anahata chakra is depicted as a green lotus with twelve petals and a star in the center of it made up of two interlocking triangles, so this could also be used as a visualisation and a way to focus the mind if it wanders. To transition out of the posture, press down into the legs and thighs again, and use the strength of the core to lift you up, maintaining length in the spine. Sit back on the heels into Vajrasana or Virasana and feel the effects of the posture. To counterpose this asana, practice a few gentle twists and move through 5-10 rounds of cat / cow. It’s never recommended to move directly from extreme extension to extreme flexion, so resist the urge to curl up into a ball, until you feel that the spine in neutral again. After this, rest in a variation of Utthita Balasana (extended child’s pose) with the knees wide a big toes touching, as this will decrease the ‘rounded’ position of the spine, promoting length. ” “It’s impossible” said pride.